Distribution: The western spadefoot is found in California’s Central Valley and adjacent foothills and in the Coast Ranges just south of Monterey County to northern Baja California, Mexico. It has been observed at elevations ranging from sea level to almost 4,600 feet (1,400 meters). It is not known to inhabit the Natomas Basin but has been found in Placer County and central Sacramento County. 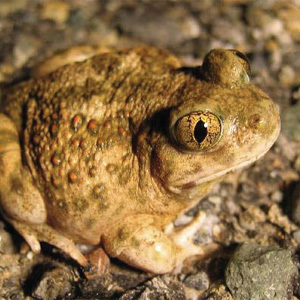 Habitat Requirements: The western spadefoot is predominantly a grassland species, although some populations can be found in pine-oak woodlands of the valley foothills. Western spadefoots require shallow, temporary pools or streams during the breeding season. Where natural vernal pools are absent, western spadefoots may make use of artificial ponds and stock tanks. Most of the year, western spadefoots reside in burrows at depths of up to 3 feet (1 meter). Spadefoots are capable of digging their own burrows but will use mammal burrows if available. Reproduction and Demography: From late winter to the end of March, western spadefoots breed in shallow, seasonal ponds and intermittent streams. Rainfall is crucial to the western spadefoot breeding cycle, because it both forms breeding pools and creates suitably moist conditions for adults to move to these pools. When males arrive at the pools they emit loud, beckoning vocalizations that travel long distances and start the formation of breeding aggregations. After mating, females attach their eggs to vegetation or the surface of small submerged rocks. Hatching occurs in as few as one to six days, with full metamorphosis occurring within three to eleven weeks. Movement: Adult movement is limited to rainy or humid nights during the breeding season; adults are rarely found on the surface at other times of the year. Newly metamorphosed toads disperse from the breeding pool within hours or days of emergence. Ecological Relationships: Adult western spadefoots consume insects, worms, and other invertebrates. Tadpoles feed on algae, plankton, and dead amphibian larvae. Predators of western spadefoot tadpoles and juveniles include California tiger salamanders, wading birds, dabbling ducks, and some mammals.